Last year I gave Colin a flying lesson for his birthday and he has held onto it until now. The voucher is for a professional flight simulator that pilots actually use to keep their hand in. We took the train to Putney and arrived quite early so we could get a coffee. Colin’s tutor Paul used to be a pilot and was coaching him on flying a Boeing 737 - one of the biggest and most common jumbos. 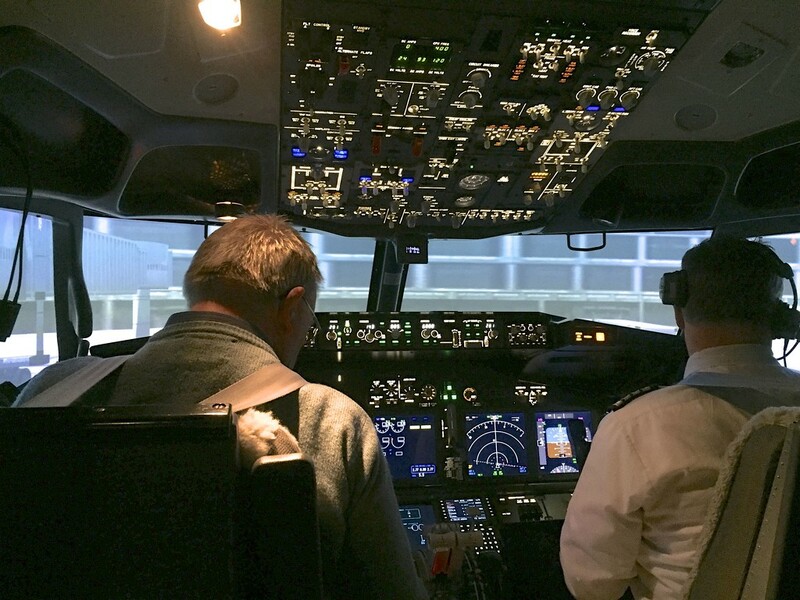 Despite it being a simulator, I was sat in the back and it seemed very real, although it did not move around, it did vibrate and I was quite nervous on take off. The lesson was going well until odds things started happening and all of a sudden Paul got really annoyed and stopped the lesson. Apparently they were having the simulators serviced that day and they should have been working for the lesson but were not. The upside is that Colin can return for another hours lesson (we were 40 minutes in!) so he can take the time to mug up on what he should be doing! Despite the cold, as we were out and about we headed over to East Sheen to pick up my new glasses for when I use the computer and then caught the 33 bus all the way back to Teddington!